The Foreign and Commonwealth Office operate a system called LOCATE for British nationals holidaying abroad or living abroad. So if a tsunami or terrorist attack occurs where you are have said you are, the FCO will more easily be able to know who is where and provide appropriate assistance. Only this service is now being terminated due to the low take up on 14 May. I am one of the just over 3,000 British nationals who registered out of an estimated 15,000 residents and 40,000 visitors annually. They say that only 1% of all British travellers have registered. Travel advice from the FCO is that there is an underlying threat from terrorism in Qatar, although I would say, from personal experience, that the threat is no more than in the UK, and less than post Boston USA. 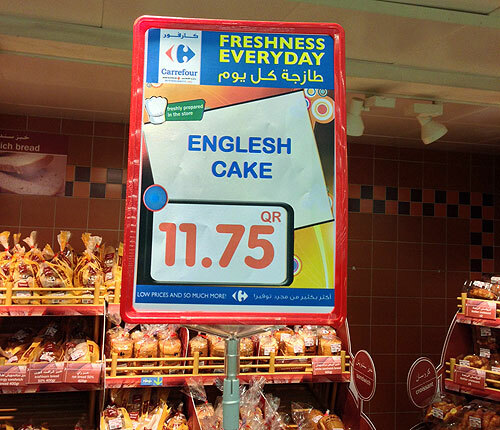 But I can keep up in touch by following British Embassy Doha news on twitter @ukinqatar and facebook . I have not looked at their facebook page until today, but their twitter posts are a strange mix of diplomatic/political information from William Hague along with the more mundane such as below. There has been a bit of a gap since my last post because I have been away in the USA on a conference. It was nice to get away for just over a week, although the 30+ hours of travelling door-to-door was tiring. I spent most of the week in Portland in Oregon. The streets were clean, the traffic ran smoothly and drivers obeyed the rules. The weather was cool and the skies mostly overcast. I saw real and substantial rain for the first time in many months. I could see green and trees around me. The bars and restaurants were vibrant and noisy. After a week I was glad to be returning to Qatar. I actually missed the warmth and the sun of Doha, the chaotic traffic, the quietness of restaurants and cafes, and the yellow sandy colour of both buildings and landscape. Coming back to J and our apartment was coming home rather than coming back to where I lived. You know how sometimes you find yourself in the wrong lane and end up having to head off in the wrong direction. 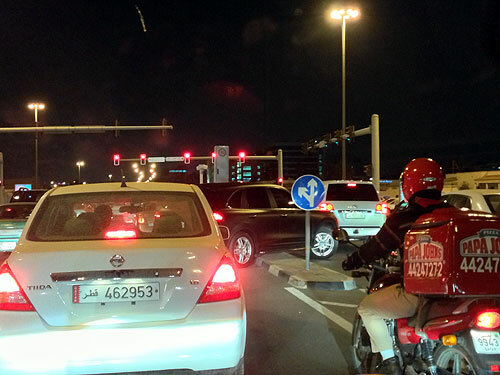 This Porsche Cayenne driver in Doha took the easy way to go straight ahead instead of having to head off to the left. While Britain was viewing horses racing round Aintree yesterday, we went for a day at the camel races. 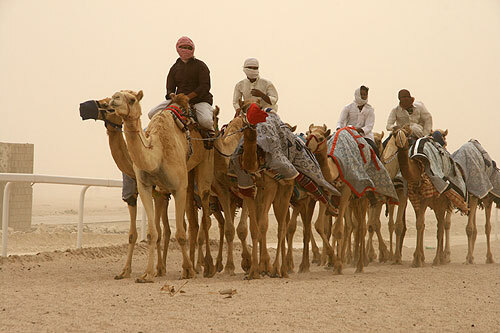 Camel racing is a popular, and what appears to be a male only, sport. 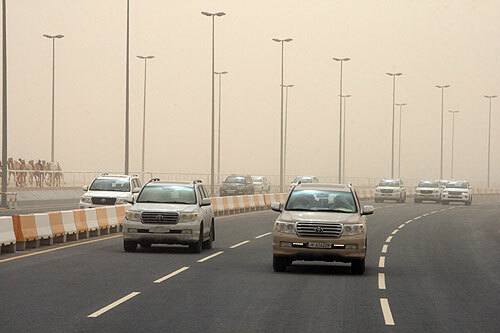 We also experienced one of the first real sand storms of the year. As we drove out of Doha, visibility was around one kilometre, but the further out of the city we went, it dropped to a few hundred meters. It looked much like a beige fog, except when stepping out of the bus, any bare flesh was hit by little pin pricks of tiny specks of desert sand. So our first view of the camel track was with our backs turned to the wind to watch the camels being exercised. Next we followed two races around the track in our bus from the start through to the finishing line. Either side of the circular track are roads. We drove along one of the roads in our bus along with loads of Landcruisers full or camel owners and trainers. 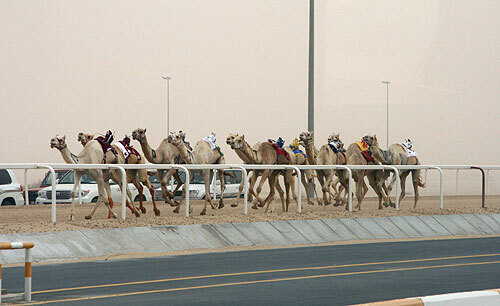 Meanwhile the camels raced along their track ridden by tiny ‘robot’ jockeys controlled from the Landcruisers. 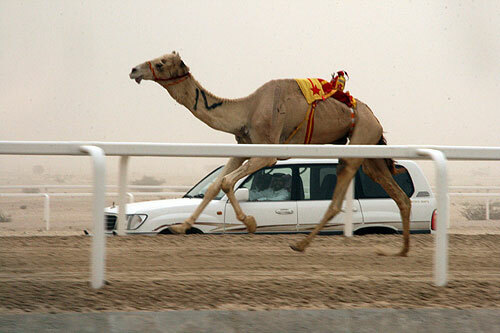 Camels are not the most elegant runners… it’s a sort of lolloping gait. In the final race, two camels gave up, turned round and went in the opposite direction. I believe the racing now stops for the summer… next time we’ll come back when the weather is better. I have now reached 3,646 km of accident and mostly incident free driving around the city of Doha. My car is unscratched and unscathed. Some of you may be thinking that I am tempting fate, and if I have a collision in the next week that I should have kept quiet… we shall see. It has not been without witnessing driving behaviour which in the UK would have resulted in a ban, and could have resulted in serious collisions and inevitable injury. I have avoided several potential but minor accidents and seen the aftermath of several where they didn’t. 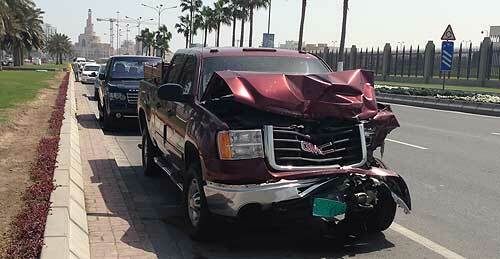 The rules state that you must not move your vehicle in the case of an accident until the police arrive. Without a police certificate after an accident it is impossible to get your vehicle repaired. The driving style is quite different from the UK. Accelerate-brake, accelerate-brake, switch lanes, switch back, undertake, overtake, ignore the speed limit, cut across from the right lane to make a left at the roundabout or equally go straight ahead when you are in the outer lane. There are advisory signs on many of the intersections, but which seem to have little effect in changing driving habits. 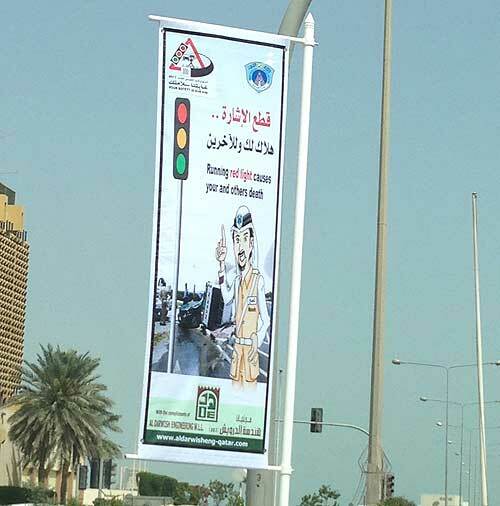 On the whole, driving in Doha is not too difficult if you factor in unexpected manoeuvres by large vehicles, combined with aggressive/defensive driving and total concentration.